Home » Global » Venezuela in the Bronx, N.Y.
Hugo Chávez mural in the South Bronx. 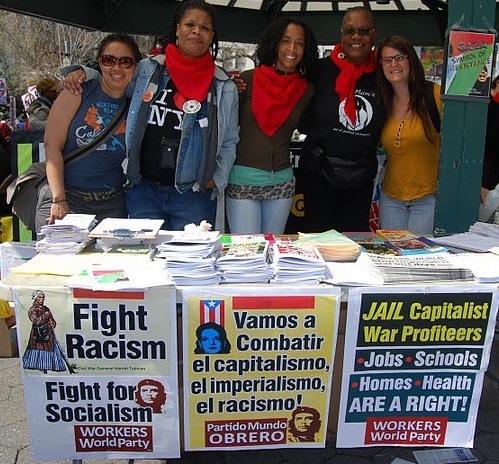 In 2006 Venezuela’s revolutionary President Hugo Chávez visited the South Bronx in New York City. In an act of international solidarity, his government launched a program to provide free heating oil to the people of that oppressed community. Ten years later, on Sept. 22, over 100 activists gathered at The Point, a community center in the South Bronx, to welcome Venezuelan Foreign Minister Delcy Rodriguez and to dedicate a three-story mural in honor of President Chávez. 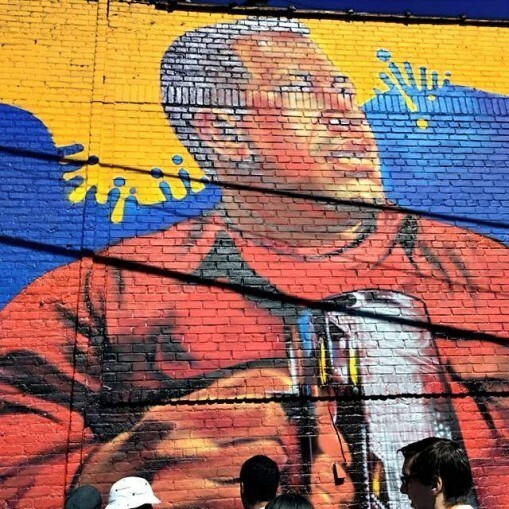 The mural, painted on the wall of The Point by Bronx artist Andre Trenier, shows Comandante Chávez, as he is affectionately known, singing along with community activist Omar Freya whose band was performing in honor of Chávez. Speaking at the dedication, Freya recounted how Chávez had spoken with every one of the hundreds of people gathered to welcome him, then picked up an instrument and played with the band. Minister Delcy Rodriguez; and Wanda Salaman, of Mothers on the Move. 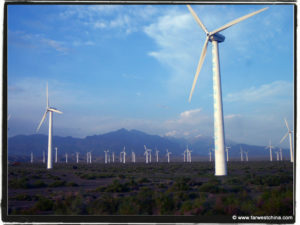 “Comandante Chávez had a special feeling for this neighborhood,” Minister Rodriguez told the gathering. 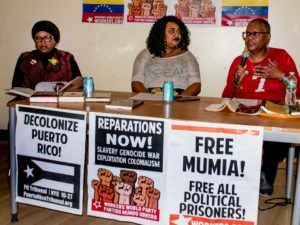 “That is why we are here because we feel that you are like us.” She expressed solidarity with the protests against police brutality in Charlotte, N.C., and the struggle against the Dakota Access Pipeline in Standing Rock, N.D. 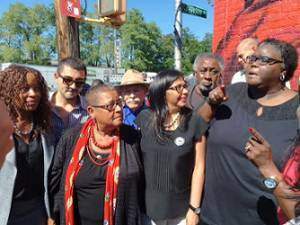 Among those welcoming Minister Rodriguez to the Bronx were The Point President Maria Torres; Estela Vazquez, of 1199SEIU United Healthcare Workers East; Shep Sadiki Ojore Olugbala, of the original Black Panther Party and the Universal Zulu Nation; Dr. Raymond Rivera, of the Latino Pastoral Action Center; and Wanda Salaman, of Mothers on the Move.